Does Grandparents Moving Away Affect Children? Download and cut out these free printable cake toppers for Mother's Day. 4 Does Grandparents Moving Away Affect Children? Make sure your mom knows exactly how you feel about her with these printable cake toppers, which come complete with cheeky sayings and quotes that are just for her. The added bonus? These ultra colorful and sleek designs, when stuck on top of cakes and other pastries, make for fun tabletop and buffet décor, too! Snag the printable and 20-minute craft tutorial below. 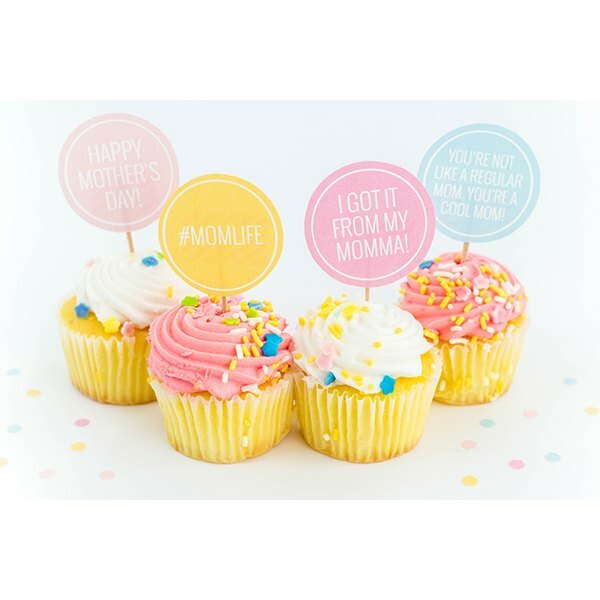 Download and print the free Mother's Day cake topper designs onto thick paper such as matte cardstock or photo paper. Print each of the designs out with scissors, and separate the large cake topper banners from the round mini cupcake toppers in two piles. Punch two sets of holes on either end of the printed large cake toppers, one by one. Make sure to offset your holes by just a little bit. This will ensure a properly angled set up in Step 3, although your angles don't need to be perfect. Finish the large cake topper banners by cutting skewers (think: the kind you use for kabobs on the grill) in half using scissors or heavy-duty sheers. Then, slip the cut skewers through the punched holes. They should be angled slightly inward thanks to the offset holes you punched in Step 2. This angled silhouette will allow for easier cake-topping in the final step. Flip over the printed and cut out mini cupcake toppers so that they're face down. Lay toothpicks towards the bottom middle of the toppers, and attach them to the printed paper using pretty coordinating washi tape. Press firmly with your fingers to set the tape. Finish by gently pushing the skewered cake banners and cupcake toppers into the tops of sugary, sprinkle-topped pastries, and you're done! We think your mom will love these cheeky sayings come Mother's Day, so pair up with your siblings and make these toppers ahead of the celebration as a group in just 20 minutes! Why Does a Woman's Relationship With Her Father Affect Her Relationship With Men?